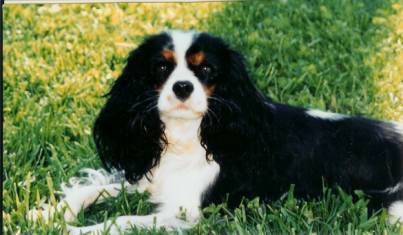 The Cavalier King Charles Spaniel has become so popular that so-called "breeders", with little or no knowledge or time in the breed, are popping up like mushrooms everywhere breeding the Cavalier to turn a quick buck. They are likely not health checking the parents or grand parents for Heart, Eye, Hip and Patella clearances nor are they attempting to avoid bloodlines that carry the major heath problems that are prone to this breed. They may say they do but you must ask for copies of at least the Heart and Eye clearances from Cardiologists and Ophthalmologists on both parents and ask if they can provide these certificates for as many generations back as possible. We are proud to be able to produce heart clearances as far back as 10 years of age on a great, great grandmother of our puppies. Do not accept the excuse that their general practioner vet states that the parents are fine or that they don't have heart problems in their bloodlines. Ask to see the certificates of health clearances from specialists who are far more skilled, for example, at detecting congenital heart problems like patent ductus arteriosis (PDA), holes in the septum of the atriums and ventricles which produce a loud murmur at 8 weeks of age. Most reputable breeders will have OFA (Orthopedic Foundation for Animals) hip and patellar clearances as well. A puppy should come to you with a general physical exam clearance from a knowledgeable vet, and the eyes should be cleared by an ophthalmologist for congenital eye problems before it is sold. (Click on the above link to OFA, and do a quick search using "Bailebrae" to see many of the health clearances we have registered with them. You will notice that many of our cavaliers and wolfhounds have also been registered through CHIC; the Canine Health Information Center that is operated by AKC and OFA in partnership. Only dogs that have passed all four of the critical health clearances- heart, eye, patellar and hip- after they have been micro-chipped, can receive a CHIC designation.) The performance of these examinations, and use of the results to guide a breeding program, is critical to meeting one of the core responsibilities of the breeder: the constant effort to improve the health and longevity of the breed. But even worse yet are the "puppy mills" where the dogs often live in deplorable conditions and their outlet for the sale of their puppies are the "Brokers" and Pet Stores! Brokers are the middlemen and women who buy these puppies cheaply from the puppy mills in this country, from Ireland and from abroad. They "flip" the puppies making a quick profit without putting any work into the rearing or care of the mother or puppies. They do not have the parents to show you and you will be unlikely to get the health certificates from the parents. You will be lucky if the pedigree even matches the puppy you are looking to buy from them. You may think that the pedigree doesn't really matter as you do not plan to breed the dog....you "just want a pet". The pedigree behind that little puppy is more important than the puppy in front of you. All Cavalier puppies are cute....you want a healthy cute one, with a good temperament. You should want to know as much as you can about this new member of your family! You don't want it suffering from a Mitral Valve Defect (MVD) and congestive heart failure at 5 years of age nor do you want the Vet bill$ to accompany such a malady...not to mention the pain and heart ache that follows. With the increasing import and sales of puppy mill bred Cavaliers we are starting to see diabetes, early heart problems, temperament problems, SM and EFS which will soon ruin the reputation of our wonderful breed. People breeding for the money and not the protection/improvement of the breed are selling these puppies on 'Open registration' so unfortunately these poor specimens will be bred by the back yard breeders, only to increase the likelihood of poor health and temperaments in the years to come in this breed. Beware of newspaper ads and internet agencies that offer connections to all the different breeds of puppies. Never buy a puppy from a picture on the internet. Reputable breeders will insist on meeting you and having you come to their home to visit them, interact with the puppies and see the puppy's relatives. You should insist on it. Fortunately. there are many breeders of Cavaliers (and, for that matter, of all pure-bred dogs) who maintain these same high standards. Seek one out; you and your puppy will be far better off for your having done so. You will be tempted by the lower ‘bargain’ pricing that the above mentioned outlets may provide but “Quality doesn’t cost, it pays” over time and never was this cliché more true than with an animal. Less health issues = less Vet expense, less stress and less heartache. This is an issue that most website do not address but with the growing demand for the Cavalier King Charles Spaniel, the increased breeding of poor specimens by novice ‘breeders’ and the importation from Irish and domestic puppy mills I feel it is only fair to you and the breed to write about it. Conscientious breeders know the expenses involved in the diligence .of revolving ones life around the dogs and thus know the worth of their puppies. Whether it is the West coast or East coast or any place in between, a well bred Cavalier ‘pet’ puppy will cost you between $2500 - $3500. Yes, you read that correctly. The average price being between $2500 - $3500 depending on its gender, bloodlines and how beautifully it is marked. Females tend to be more in demand and I charge more for them than for the males. If a male is neutered there is not much difference between them. Males are more willing to please you. Both genders are clean, loving and sweet. Neutered males smell clean because you have eliminated the ‘testosterone smell’ in their urine, which is what most people object to. And they are not marking every bush that you pass. General consensus is that the males in most breeds tend to be “in love with you”, where as the females “love you”. Another way of describing it is to say that “the girls say ‘love me’ and the boys say ‘I love you’.” This is true of my Irish Wolfhounds as well. My big males will do anything for me. The boys just want to please you, where as the girls tend to be slightly more independent. The price for a show/breeding, “Open Registration” puppy is negotiated by private treaty and the pricing varies depending on the conditions of the sale, i.e. : co-ownership, or a puppy back, free stud service from the male puppy being sold, wanting to share your bloodlines with another respected breeder, etc.. Selling a dog with “Open Registration” means that the breeder is ‘selling the bloodlines’, and not just the puppy. Some of you are saying “well I can’t see spending that kind of money, after all, it is ‘just a dog”. Please stop and think of what you spent on your last vacation – be it a cruise, skiing in the mountains, a trip to Europe or Hawaii? I would happily forgo one vacation expense to spend that money on a Cavalier, the shared joy of which will last much longer than any vacation. I’d much rather stay home and bond with a puppy. Some breeders have older dogs or yearling puppies that didn’t turn out to be ‘show quality’ and you may get them for less, usually the cost of the spay/neuter. Or most of our local Cavalier clubs (see links) have Cavalier Rescue services. Please look into those options first before buying a ‘cheap puppy’ and thus supporting the puppy mills, Brokers, backyard breeders and pet stores. In your decision making process I hope this has helped to educate and clarify. Contact me with your Questions please.